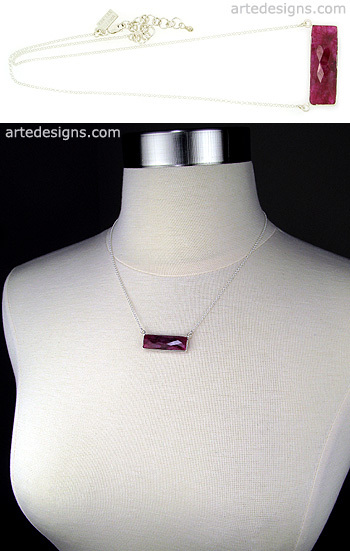 This faceted rectangle ruby gemstone is bezel set in sterling silver, creating a necklace that's modern, edgy, and will never go out of style. Wear it alone or layer it with other necklaces. Ruby is believed to help maintain wealth and passion, promote healing, and bring positive dreams. Ruby gemstones vary in shape, size, and color, so no two are alike. Pendant is approximately 1.25 inches wide. Adjustable 16 - 18 inch sterling silver chain with a lobster clasp.